Everyone looks forward to shake days on Isagenix: they’re your opportunity to cook up a tasty meal! No matter what meal you choose to splurge on, you can be sure to find great-tasting recipes that still keep you in ketosis. This recipe tastes decadent, but is still full of protein and healthful vegetables to keep your body feeling energized throughout the day. This recipe makes 4 servings, so you can prepare it ahead of time and eat it throughout the week. Trim the mushrooms and cut them in quarters. Dice the bacon. Fry the bacon and mushrooms in butter in a skillet over medium-high heat until they are golden brown. Season with salt and pepper to taste and place contents the of the skillet in a greased baking dish. Add the remaining ingredients to a medium-sized bowl and whisk to combine. Season with salt and pepper. 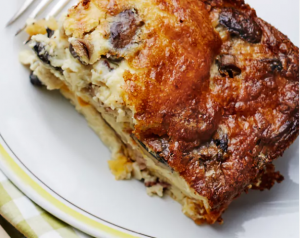 Pour the egg mixture over the bacon and mushrooms and bake in the oven for 30-40 minutes or until golden brown on top and set in the middle. Seafood is a great option for anyone following a ketogenic diet; it’s typically high in protein and nutrients while also being low in fat and carbs. 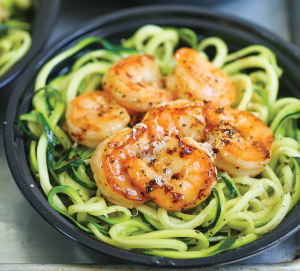 This amazing recipe combines shrimp and zucchini noodles so you can feel like you’re eating a delicious shrimp scampi without compromising your Isagenix meal plan! Combine butter and olive oil in a large skillet over medium-high heat. Add shrimp, shallot, garlic, and red pepper flakes. Season with salt and pepper, to taste. Cook, stirring occasionally until the shrimp are pink (about 2-3 minutes). Stir in vegetable stock, lemon juice, and lemon zest. Season with salt and pepper, to taste. Bring to a simmer. Stir in zucchini noodles until heated through (about 1-2 minutes). You’re probably thinking that for that one meal you get on a shake day, you don’t want to have a salad. 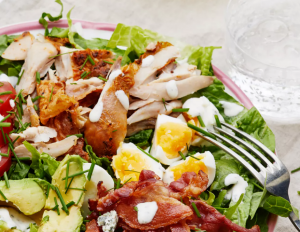 However, this cob salad is full of delicious, protein-packed meats and creamy cheese to satisfy your taste buds while keeping your body in ketosis. First, prepare the dressing. Combine mayonnaise, ranch seasoning, and water. Season with salt and pepper and set aside. Next, place the eggs in boiling water for 8-10 minutes. Cool in ice water for easier peeling. Chop them roughly. Fry the bacon in a hot, dry skillet until crispy. Cut grilled chicken in smaller pieces and chop up vegetables. If you’re starting with raw chicken, fry it in the bacon fat, and season with salt and pepper to taste. Distribute everything on a bed of shredded or torn lettuce. Season with salt and pepper (especially the eggs). Drizzle with dressing and top with finely chopped chives. Some of us have a massive sweet tooth. If your calories allow for it, you may want to include a sinfully sweet dessert in your shake day meal plan. 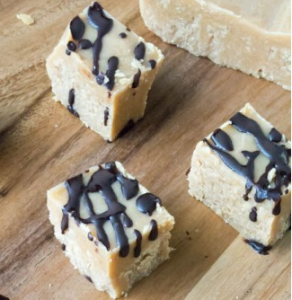 This fudge recipe will satisfy your sweet tooth and still give you plenty of protein to make your body happy. Put this into your blender and add the rest of the ingredients. Blend until combined. Pour into a parchment-lined loaf pan. If using chocolate sauce, whisk ingredients together and drizzle over fudge after it’s been set.